In 2013, the International Council of Management Consulting Institutes ( ICMCI www.cmc-global.org ) completed a successful pilot on a proposed CMC-Firm initiative, the objective of which was to create a global directory of national Accredited Consulting Practices (ACPs), all large or medium sized firms who play a key role in the consulting industry and who also manage or are developing international connections in a market where ICMCI is a main player. The CMC-Firm initiative gained validation from ICMCI’s Professional Standards Committee and was launched in 2014. The ICMCI’s directory of CMC-Firms provides a platform through which so approved firms can profile their capabilities to clients and to other practices who are seeking to collaborate in international markets. International Development Ireland (IDI, www.idi.ie ) has become the first ICMCI CMC-Firm approved ACP in Ireland. Established in 1989 and headquartered in Sandyford, Dublin, with offices in Saudi Arabia, United Arab Emirates, Bahrain, Turkey and Northern Ireland, IDI’s business focus is on the practical implementation of projects which underpin institutional/ corporate development. Over the past 29 years the firm has completed 260 projects in 80 countries. IDI works with clients to establish and/or strengthen the institutions and underlying factors for success in areas including investment and export promotion, economic and industrial zones, innovation and R&D, banking, tourism, regulation and SME development. IDI’s teams of expert practitioners work closely with client company staff to turn “strategy into action” and results. IDI also share this knowledge through implementation focused flagship and bespoke capacity building and training courses in the areas of the firm’s expertise. 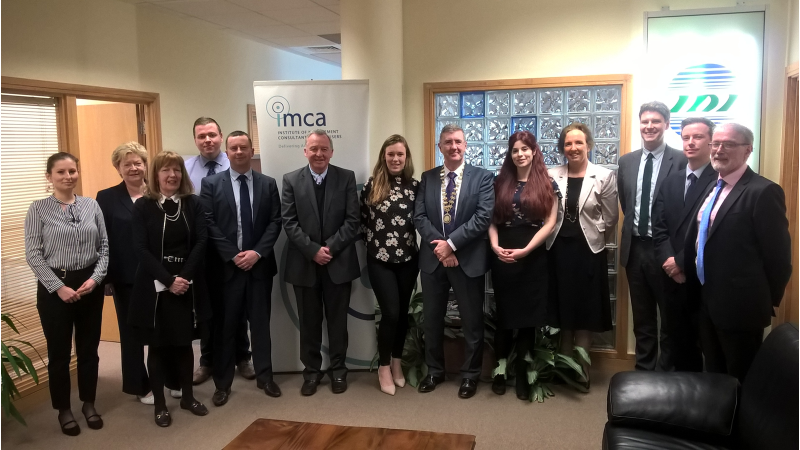 In March, 2018, IMCA President Martin Markey visited IDI head office to present IDI with its CMC-Firm parchment. Pictured are Martin Markey and Denis McCarthy with Ronan Deignan, Managing Director and Ted Bowe, Executive Director, and members of the IDI Team.